The Other Boufs: Mommy, Daddy, Katie, Timmy ... and more! : 6 Months Old - Mr. Bad Boy! I know this is a cliche, but seriously - where the heck has the time gone? It seems like yesterday that I was pregnant (probably because it sucked so bad at the end that is has left a lasting impression). But wow, it really does seem like the time is flying by. When Katie was a baby she was so fun, but I was so impatient for her to grow and to see what her personality would be like as she got older. This time - I just don't want the baby phase to end!!! From the first second I held Timothy I was overcome with the feeling of being completely content to hold that little baby...and to HOLD ON to these baby days! Timmy is continuing to get taller, but is starting to thin out. To be quite honest...I don't REALLY see him thinning out, but according to "percentiles" he is. Seriously, how can the rolls in his thighs be AVERAGE?!?! (You'll see what I mean when you watch the video at the end of this post.) Tim had his 6 month wellness visit today (sorry, I'm backdating this post since I didn't feel up to doing it yesterday.) He is now 18 lbs (55th %) and 27 1/2 inches (90th %). I do actually think he was slightly more than 18 lbs; she read it while it was still teetering, but whatever, he's about 18 lbs. He is still going back and forth with his sleep routine. He slept COMPLETELY through the night for 4 nights in a row the week after we got back from Disney and has been back to getting up 1-3 times ever since. Damn teeth! He does go right back to sleep though as soon as I nurse him. It's funny, just about a week ago I was thinking to myself that since 5 months, he really hasn't reached many more milestones. He's turned into Captain Destructo in knocking anything he can down from wherever it should be and grabbing for anything he can get his hands on. But besides that, he had only gotten one more bottom tooth and started eating solids. He loves cereals, squash and peas; he tolerates carrots, green beans, and sweet potatoes; he really doesn't like apples and bananas very much unless it's watered down and mixed with cereal, then he loves it, and he DETESTED a first taste of kiwi. I am very proud of myself that I have actually MADE baby food this time around. Well, proud of myself and embarrased by myself as I was with Katie. I can't believe that I bought baby bananas and applesauce. He is also quite messier than Katie ever was (well when she ate baby food, anyway) - a combination of not opening quite enough and putting his hands in his mouth between every bite. "But Daddy, I'm charming. Come on, let me get up!" "Just a little bit closer, so I can grab your camera!" I was looking through my baby book a few weeks ago and was amazed at how much I (as a baby) look like Timmy. While he and Katie really do look similar when comparing their baby pics and some of Katie's baby pics look me, there is no question when looking at my baby pics that Timmy and I look alike. It's true...but I still think he looks awfully like his daddy when they're together, too. See, I look like Mommy AND Daddy! You are a winner at my blog...please contact me at knotyladee@aol.com to claim your goodies! these pics are so cute. i cant believe he's 6 months already!!! 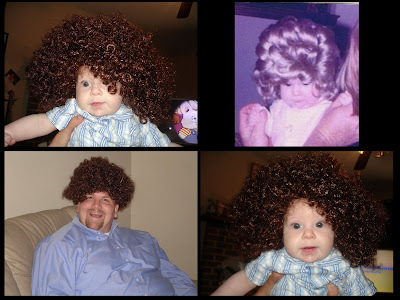 i saved the one with him and you and chris in the wig to my desktop background...i couldnt stop laughing! Oh did my cats look up when I clicked on your video!!! I think it was your Weee noise. Great video. Definite keeper for when he gets older to pull out for his dates to see!!! WOW! 6 months! It's crazy!!!! Where did the time go??? And, those chunky legs! HOLY! ps Ok, so The Chunk aka Silly Willy is officially only 7lbs less than his cousins! 6 months already? I can't believe it! You are the winner on my blog. Delaney drew your name! Send me your mailing address and I will get it in the mail to you.